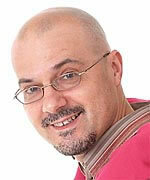 Diego Garro is a senior lecturer in Music Technology, Electroacoustic Music and Video Art at Keele University. His research output includes fixed-media audio and audio-visual works, which are regularly selected and performed in UK and abroad and have often received international recognition in various festivals, conferences and competitions, including prizes in two consecutive years at the Bourges International Competition of Electroacoustic Music and Sound Art in 2004 and 2005 and the “Visionen Preis” at the 2012 Gemart Festival in Hannover. His activity as researcher and educator focuses on working practices and compositional languages that bridge the electroacoustic idiom with other aspects of popular culture and experimental art (electronica, glitch, video).